State Representative Marie St. Fleur today pulled out as a candidate for lieutenant governor after the Boston Globe reported that she has delinquent tax debts in three of the last four years and owes $40,000 in student loans, a senior Democrat said today. The announcement came one day after Attorney General Thomas F. Reilly announced that St. Fleur was his choice to run as his running mate. Candidates for governor and lieutenant governor run separately until the party primary, and then run as a ticket for the general election. The Globe reported today that St. Fleur has had three delinquent tax debts in the last four years, including an April 2005 federal tax lien of $12,711 against her and her husband. She also disclosed that she also owes $40,000 in delinquent federally backed student loans. St. Fleur told the Globe that she had paid down the federal tax debt to about $8,000 by making $500 monthly payments since last spring. But later, Corey Welford, a Reilly campaign spokesman, corrected her, saying that she had, in fact, made only one $500 payment last May, and that the balance is still more than $12,000. 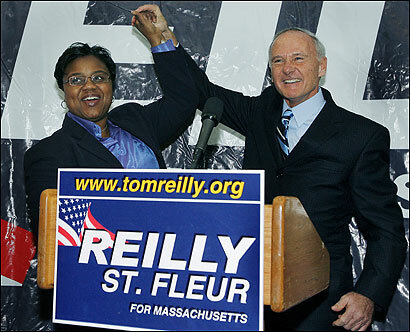 Reilly, St. Fleur said, first approached her Saturday about being his running mate and offered her the spot on Sunday. She said she told Reilly that she had "some financial issues" with taxes and student loans, but that he didn't ask her to provide any numbers and only sought assurance from her that she was dealing with the problems. "This is embarrassing to me; I knew this was going to come out," St. Fleur said, adding later: "I knew that when I stepped out like this that it might be the end of my career." St. Fleur's financial troubles sparked revelations from another politician in the thick of this year's gubernatorial campaign: Deval Patrick, Reilly's top rival for the Democratic gubernatorial nomination, released a statement disclosing that he, too, had been a tax delinquent. "More than a decade ago, Diane and I had an installment agreement with the IRS to pay, on a monthly basis, an unexpected tax liability," Patrick said in a statement issued to The Associated Press. "We missed one or two of our installments. This triggered an IRS lien. We took immediate steps to pay off the balance and within five months discharged in full the $8,778 we owed." In Massachusetts, candidates for governor and lieutenant governor run separately through the primary, before being united in a common party ticket for the general election in November. Reilly's anointment was expected to give St. Fleur a boost at the polls.